Bend a bow back between bodies and sounds to overcome the classical cohabitation of dancers and musicians. Without switching upside down their rules, they are going to dig in their moves, to acquire each other’s rythms to obtain an unseen sense emerging from it. How does a percussionist dance? What is the sound of a dancer? 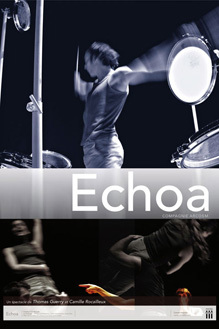 Echoa hones dance musicality and highlights the choreography of music. It is an unforeseen dance experience which can be seen with ears… sometimes sweet as a whisper, some­times strong as a carnival, never devoided from ardour or fantasy. A funny and poetic performance for all the family. Dancers: Thomas Guerry or Sébastien Cormier & Emmanuelle Gouiard or Marie Urvoy or Eléonore Guisnet-Meyer.